Click the individual tabs above to read more in-depth explanations of these terms as well as counts and digits. 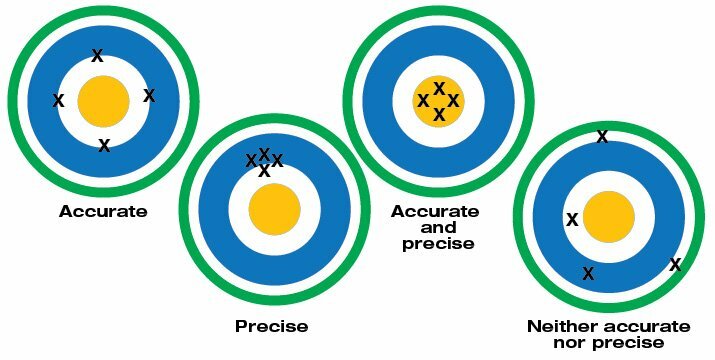 Accuracy refers to the largest allowable error that occurs under specific operating conditions. Accuracy is expressed as a percentage and indicates how close the displayed measurement is to the actual (standard) value of the signal measured. Accuracy requires a comparison to an accepted industry standard. The accuracy of a specific digital multimeter is more or less important depending on the application. For example, most AC power line voltages vary ±5% or more. An example of this variation is a voltage measurement taken at a standard 115 V AC receptacle. If a digital multimeter is only used to check if a receptacle is energized, a DMM with a ±3% measurement accuracy is appropriate. Some applications, such as calibration of automotive, medical aviation or specialized industrial equipment, may require higher accuracy. A reading of 100.0 V on a DMM with an accuracy of ±2% can range from 98.0 V to 102.0 V. This may be fine for some applications, but unacceptable for sensitive electronic equipment. Accuracy may also include a specified amount of digits (counts) added to the basic accuracy rating. For example, an accuracy of ±(2%+2) means that a reading of 100.0 V on the multimeter can be from 97.8 V to 102.2 V. Use of a DMM with higher accuracy allows a great number of applications. 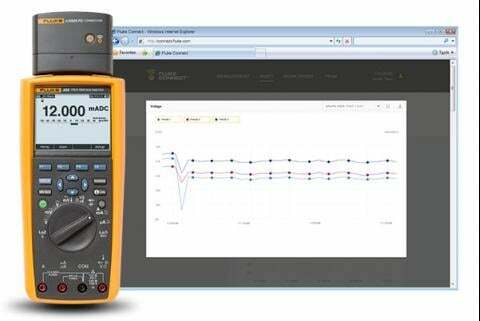 Basic dc accuracy of Fluke handheld digital multimeters ranges from 0.5% to 0.025%. Resolution is the smallest increment a tool can detect and display. For a nonelectrical example, consider two rulers. One marked in 1/16-inch segments offers greater resolution than one marked in quarter-inch segments. Imagine a simple test of a 1.5 V household battery. 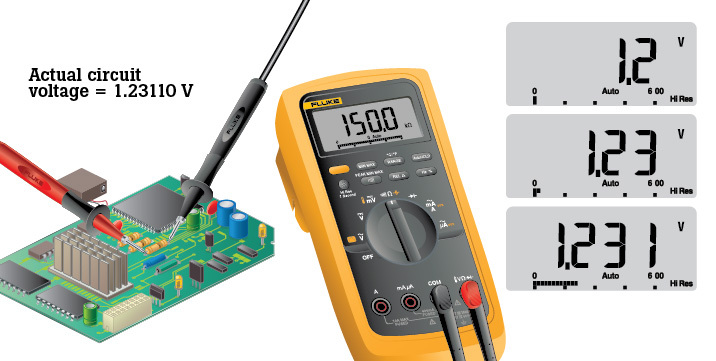 If a digital multimeter (DMM) has a resolution of 1 mV on the 3 V range, it is possible to see a change of 1 mV while reading 1 V. The user could see changes as small as one one-thousandth of a volt, or 0.001. Resolution may be listed in a meter's specifications as maximum resolution, which is the smallest value that can be discerned on the meter's lowest range setting. 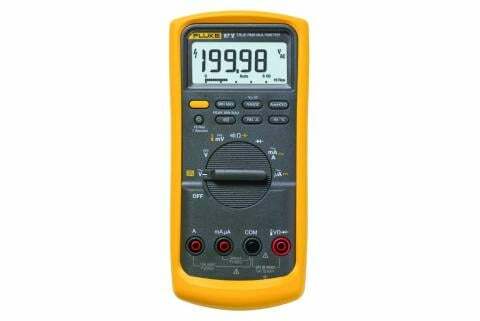 For example, a maximum resolution of 100 mV (0.1 V) means that when the multimeter's range is set to measure the highest possible voltage, the voltage will be displayed to the nearest tenth of a volt. Resolution is improved by reducing the DMM's range setting as long as the measurement is within the set range. Digital multimeter range and resolution are related and are sometimes specified in a DMM’s specs. Many multimeters offer an autorange function that automatically selects the appropriate range for the magnitude of the measurement being made. This provides both a meaningful reading and the best resolution of a measurement. If the measurement is higher than the set range, the multimeter will display OL (overload). 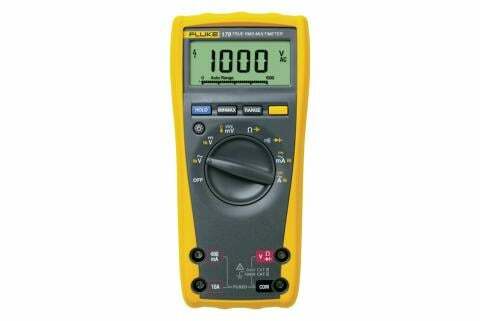 The most accurate measurement is obtained at the lowest possible range setting without overloading the multimeter. Precision refers to a digital multimeter’s ability to provide the same measurement repeatedly. A common example used to explain precision is the arrangement of holes on an shooting-range target. This example presumes a rifle is aimed at the target’s bull’s-eye and shot from the same position each time. If the holes are tightly packed but outside the bull’s-eye, the rifle (or shooter) can be considered precise but not accurate. If the holes are tightly packed with the bull’s-eye, the rifle is both accurate and precise. If the holes are spread randomly all over the target, is neither accurate nor precise (or, repeatable). In some circumstances, precision (repeatability) is more important than accuracy. If measurements are repeatable, it’s possible to determine an error pattern and make compensation for it. Counts and digits are terms used to describe a digital multimeter's resolution. Today it is more common to classify DMMs by the total counts than by digits. Counts: Digital multimeter resolution is also specified in counts, and DMMs that offer higher counts provide better resolution for certain measurements. For example, a 1999-count multimeter cannot measure down to a tenth of a volt if measuring 200 V or more. 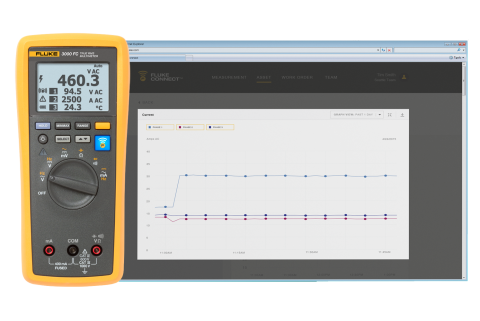 Fluke offers 3½-digit DMMs with counts of up to 6000 (meaning a max of 5999 on the meter's display) and 4½-digit meters with counts of either 20000 or 50000.